One of the biggest challenges facing Catholic schools is finances—how to keep quality schools running with a tuition that is affordable. Many schools need parish or diocesan subsidies (along with other fundraising and revenue sources) to operate. Subsidies draw from parish and diocesan budgets potentially making it more difficult for these institutions to balance their expenses and revenue. However, Catholic parishes with a school or those that support a regional school are actually less likely than those without an association with a school to run a parish operating deficit. Overall, about three in ten U.S. parishes have parish expenses that exceed their revenue. Of those parishes reporting a parish operating deficit, the average size for the shortfall is 16% of revenue (for more see CARA’s report for The Emerging Models of Pastoral Leadership on this topic). Thirty-four percent of parishes without a school run deficits compared to 28% of those with a school and 27% of those that support a regional school. Among those parishes with a school commitment, on average, 23% of the parish budget is devoted to the school. Among those parishes with deficits, those with schools have an average shortfall measuring 13% of their revenue. This is slightly lower, 11%, in parishes that support a regional school. Those without a school have shortfalls averaging 20% of their revenue. What is this some weird Catholic freakonomics? 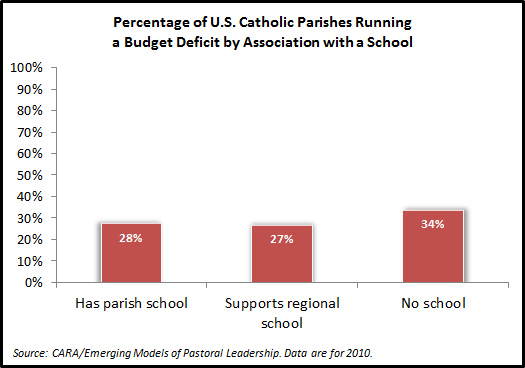 Should struggling parishes go out and start a school to reduce their parish budget deficit? No. Although there is a correlation between having a school and a lower likelihood of running a parish budget deficit this is not causation. 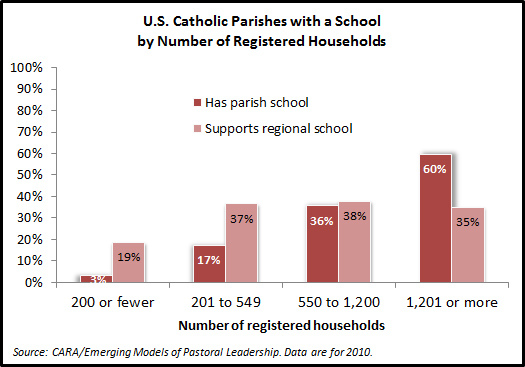 Both of these factors are related to parish size, as measured by the number of registered households. Small Catholic parishes are significantly less likely to have a school and more likely to struggle financially. On average, a parish with 200 or fewer registered households is running a slight deficit (-0.5% of revenue). By comparison, a parish with more than 1,200 registered households has a parish budget surplus (+7.1% of revenue), on average. The costs associated with the physical plant of a parish do not change with the number of registered households but the amount of revenue a parish brings in does. There are economies of scale that allow larger parishes to provide more to their parishioners—including schools (...there are drawbacks as well such as a challenges in building a vibrant parish community and lower levels of giving per household. For example, a parish with 200 or fewer registered households receives an average of $12 in offertory per household, per week. By comparison, a parish with more than 1,200 registered households receives $7.81 per household, per week). Larger parishes also tend to be more likely to be growing demographically. In the average parish with 200 or fewer registered households (i.e., 15% of U.S. Catholic parishes) there are about seven infant or child baptisms and about six funerals per year. By comparison, the average parish with 1,201 or more registered households (i.e., 33% of U.S. Catholic parishes) has about twice as many infant and child baptisms (113) than it has funerals (55) per year. By no means is it true that running a parish school is an easy thing to do. Parish and diocesan subsidies could be used elsewhere. But at what cost? Recent CARA research revealed that Catholic schools are essential in recruiting and forming the next generation of Catholic leaders from priests to sisters to lay ministers (1, 2, 3, 4). More so, CARA research has shown that Catholic schools are essential to shepherding many young Catholics through childhood sacraments. And of course don’t forget that Catholic schools provide a great education. In the long-run Catholic schools are a solid investment for the Church even when the annual balance sheets can be so challenging. Sociologist Philip Brenner has produced an excellent series of journal articles on the measurement of church attendance in the U.S. and cross-nationally. Some of his work utilizes time diary studies. These are unique and well suited for measuring attendance. In standard surveys, when an interviewer asks a respondent if they attended religious services this week or how often they do so generally there are social desirability pressures that often lead some non-attenders or infrequent attenders to “over-report” their attendance. 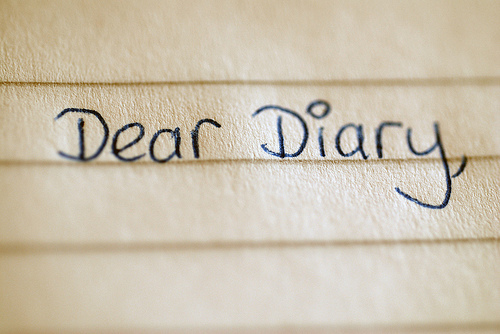 Time diaries remove this pressure as the participant is just filling out a table of time of what they did in a day. They are not “primed” in any way to report any specific activity (…these are the data often used for estimating how many hours Americans spend watching television or commuting to work per day). Brenner’s most recent article in The Sociology of Religion looks at cross-national attendance data. In his review of the literature he writes an excellent short description of “the effect of life-stage” on religion, which I discussed in a previous post: “After being baptized in, named by, or introduced to the religious community as an infant, the young individual attends regularly until s/he leaves the parental home. The stage of ‘prodigality’ characterized by a lack of attendance, ends after the young adult marries and returns to a pattern of regular attendance, perhaps hastened by the arrival of a child. Attendance remains relatively stable until fluctuations in midlife, after the departure of adult children” (2012, p. 366). Following this life-stage model, one of the reasons we might see declining church attendance is a growing adultolescence where people wait longer to marry or have children or choose not to do so at all. Time diaries present a unique and very accurate method to study this model of religiosity. The U.S. government conducts a variety of large scientific surveys (calculating unemployment, income data, etc.) but typically does not ask anything related to religion in these studies. There is one exception and it is a time diary study called the American Time Use Study (ATUS). This is conducted by the U.S. Census Bureau and sponsored by the Bureau of Labor Statistics. If a respondent attends church on Sunday and records this in their time diary this is captured in the study. ATUS is one of many other time diary studies that have been conducted in recent decades in the U.S. which have been collected and formatted for combined use by the Centre for Time Use Research (CTUR) as the American Heritage Time Use Study (AHTUS). 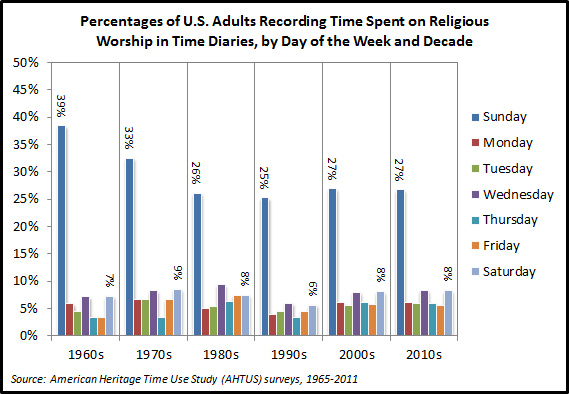 This allows researchers to study how Americans have used their time from the 1965 to 2011—including the hours devoted to religious worship. 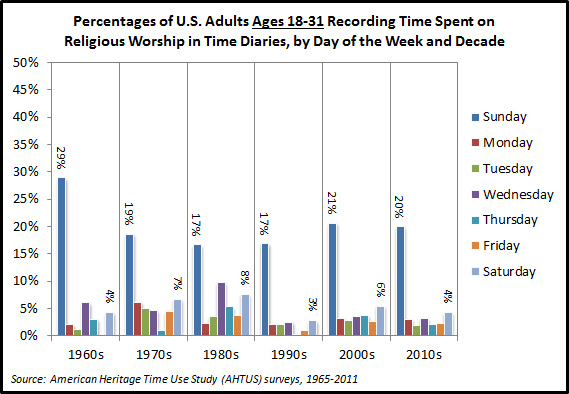 So let’s read thousands of Americans diaries… Below is a figure summarizing the percentages of American adults who report time spent on religious worship by day of the week in each decade since the 1960s. Attendance declined in the 1970s and again in the 1980s but has since stabilized at a level where just more than one in four Americans record attendance at religious services on Sundays in time diary studies. There are also noticeable upticks in attendance on Wednesdays and Saturdays. Note that some of the people reporting worship on these other days are also doing so on Sunday so the percentages are not necessarily additive. Currently, America’s Millennial Generation (born 1982 or later) includes those ages 31 and younger. How do the diaries of people in this age group compare across time? Just as the life-cycle model would predict, the 18 to 31 cohorts always have lower worship levels than the overall general population. However, there is no evidence of any recent decline in their attendance. If anything, there is a slight uptick in worship time among this demographic since 2000—including in the first two years of the 2010s which measures the Millennials specifically. Disaggregating the data from 2003 for Sundays specifically we can see a bit more of this pattern of “revival” among Millennials. In 2011, their diaries began to look a lot like those of the previous generation (born 1961 to 1981; Generation X) yet still a bit below those of the Baby Boomers (born 1943 to 1960) and the Silent/G.I. generations (born before 1943). In a recent post I spoke of a desire for more data that would reveal what the “competitors” to Mass attendance are for Catholics (i.e., what else are they doing on Sundays that might lead them to miss Mass?). Unfortunately, the time diary studies rarely ask for the religious affiliation of participants so we can’t break this out. But we can draw broader conclusions form these data. If you are a Millennial we can guess you might be sleeping through church. Forty-three percent of the 24 hours of Sunday are spent on sleep by those ages 31 and younger—more than the members of any other generation. Now it is true that younger people need more sleep and getting older may often bring on mild insomnia so perhaps we should not be too surprised. Sunday is after all a day of rest is it not? Millennials are also ever so slightly more likely to be working on Sunday—perhaps a product of our modern economy where everything seems open for business on Sunday a.m. The youngest Millennials may be more likely than older Americans to have weekend retail or service jobs preventing their church attendance. Television may not be keeping them away from church. Millennials spend the least amount of time with the tube whereas the retired set are more avid watchers. 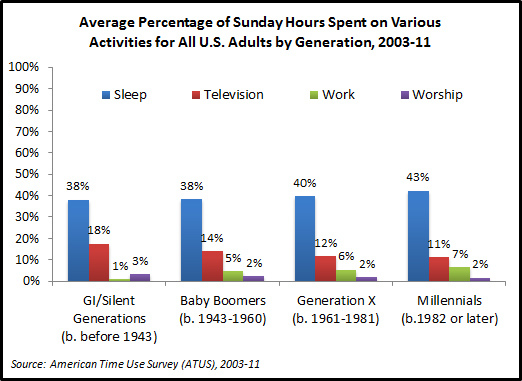 With that said hours of television in each generation still greatly outnumber average time spent on worship (note that these averages include “0” time observations for those who do not report the activity at all. If one looks at worship time only for those who report worship there is almost no difference in time spent on this by generation or any differences between decades. Services have not become shorter or longer over time). So how can we know more specifically about what Catholic Millennials are doing? To see a more detailed portrait we can look to recent CARA Catholic Polls (CCP). 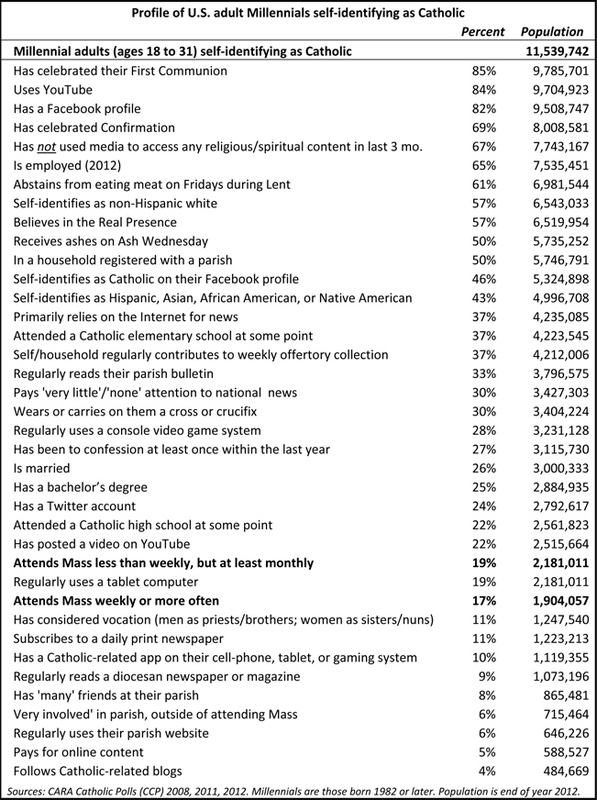 In the table below (click the table to enlarge) we show the many aspects of life reported by adult Millennials—who currently number approximately 11.5 million people—in CCP surveys. Half of adult Millennial Catholics (50%) are in a household registered with a parish and 37% of Millennials (or someone in their household) regularly contributes to a parish weekly offertory collection. A third (33%) says they regularly read their parish bulletin. Seventeen percent attends Mass every week and 19% do so less than weekly, but at least once a month (...some of those attending less than weekly are in pews on any given Sunday meaning that the weekly numbers of Millennials at Mass exceeds 22%). Fifty percent say they receive ashes on Ash Wednesday. As we’ve noted before here, Millennials are even more active during Lent than most other Catholics. If the Church wants to say something to Millennials they should circle February 13, 2013 on their calendars as a critical mass will be passing through the doors of Catholic parishes on this day. Three in ten (30%) wear or carry a cross or crucifix and more than a quarter (27%) go to confession at least once a year. Eighty-four percent use YouTube but only 2% of these users say they watch anything about religion or spirituality on this site. Seventy-two percent say they watch music videos, 53% watch comedy content, and 46% watch viral videos on YouTube. Note that only 7% of older Catholic YouTube users say they watch any religious or spiritual content on this site. About two-thirds (67 percent) of Millennials say they have not accessed any religious or spiritual content in any medium (e.g., television, internet, print, radio) in the three months before they were interviewed. Twenty-two percent of Millennials say they have posted a video to YouTube at some point. Eighty-two percent of adult Millennial Catholics are on Facebook and 24% have a Twitter account. One in ten (10%) has a Catholic-related app on a mobile or gaming device. Thirty-seven percent say they primarily rely on the internet for their news. Yet three in ten (30%) say they pay “very little” or no attention at all to national news. If you want to get their attention don’t put an ad in a secular newspaper. Just 11% subscribes to a daily newspaper and only 5% say they pay for online content. Two-thirds (65%) of adult Millennial Catholics are employed and 26% are married. If digital content is not pulling them away from Mass, work and family obligations may be doing so. Friendships are unlikely to draw many of them to Mass as only 8% say they have “many” friends in their parish. Just 6% say they are very active in their parish outside of attending Mass. 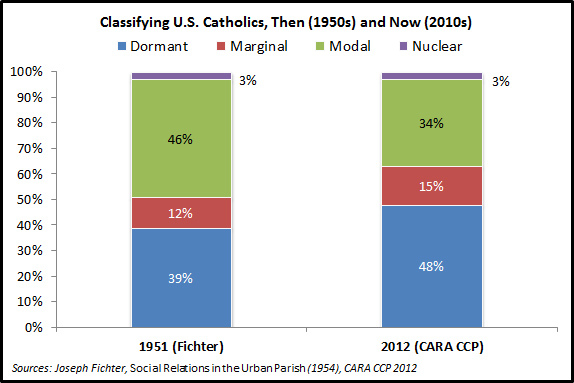 For comparison we show approximations of these same groups now in CARA surveys based on dormant Catholics being those who currently self-identify as Catholic but do not attend Mass annually. Marginal Catholics attend Mass on Christmas and Easter only, modal Catholics attend Mass at least once a month and nuclear Catholics are those who say they “very” involved in parish outside of Mass. The number of dormant Catholics has increased by 9 percentage points since 1951 and the number of modal Catholics has declined by 12 percentage points. 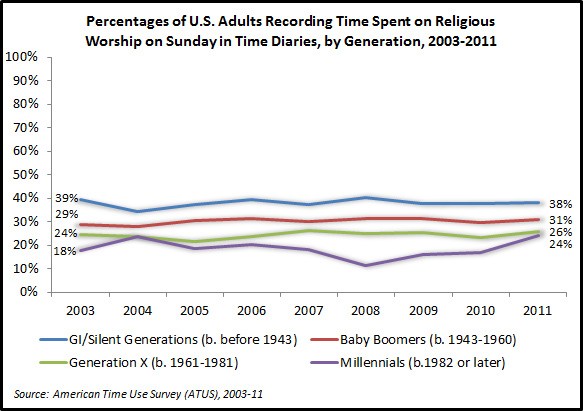 These trends are consistent with what we see among the broader population in the worship data from the time diaries. Too many have forgotten about all the “dormant” religious in the 1950s and have unrealistically embellished the size of the “modal” and “nuclear” groups. Perhaps our “memory” of religiosity further in the past is quite unrealistic as well. Historians and social scientists for example have noted that churches were far from full in earlier times. As sociologist Rodney Stark notes, using original source material, “As for the ordinary people, during the middle ages and during the Renaissance, the masses rarely attended church. … In further support of these reports, an extensive survey of surviving parish churches in various parts of Europe reveals them to be too small to have held even a tiny fraction of local inhabitants” (pgs. 255-56). So perhaps Millennials are just repeating the patterns of attendance we have known for more than a millennium? Even if they are it is still the case that there are a lot more potential distractions now than in 16th century Europe. Imagine how the Protestant Reformation might have unfolded if the Ninety-Five Theses were posted in a video on YouTube rather than on a church door. Luther didn’t have to compete for attention with funny cat videos. Photo above courtesy of incurable_hippie from Flickr Commons.